An introduction to proficiency testing, external quality assurance, and peer testing programs. 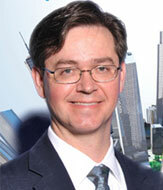 Measures like SDI, CVI, and Total Error are defined and discussed. "What is external quality assessment? Why do laboratories need external quality assessment? What is the difference between peer comparison and proficiency testing? How does a peer comparison program work? How are peer comparison results reported? What is a Total Error? What is a Total Error graph? What does a peer comparison report look like? No Laboratory is an island. Labs generate test results that get compared to other results from other labs. If guideliness, cutoffs, reportable ranges or reference ranges are brought in from sources outside the laboratory, there must be assurance that the laboratory can adopt these external recommendations. The way to do this is through external quality assurance. What is external quality assessment? In an external quality assessment program, a group of laboratories analyze the same specimens (usually the same control materials, exact same lot numbers) and submit their results to a central facility where the data are examined for outliers, and means and SDs are calculated to characterize the performance of the group of laboratories, and reports are generated to compare the performance of an individual laboratory to the peer group and sometimes to target values established by reference methods or reference laboratories. Laboratories can easily determine the precision of their methods by calculating the mean, SD, and CV from recent control results. Reliable estimates of precision performance are available as long as there is enough data obtained over a long enough period of time. It is much more difficult to determine the accuracy of methods on an ongoing basis! The laboratory needs to compare its test results with the true or correct values. “True values” are often approximated by using results from other established laboratory methods. For example, in the initial validation studies for a method, a group of patient specimens are usually analyzed by the new method and an established method. The mean of results by the new method is compared to the mean of results by the established method to estimate the bias (average difference) between methods. The essential feature of an external quality assessment program is the availability of comparison results from other methods in other laboratories. The unique capability of an external quality assessment program is to monitor of the accuracy of methods and make sure that the stable performance of your methods are on target with the true or correct values. Want to read the rest of this article? 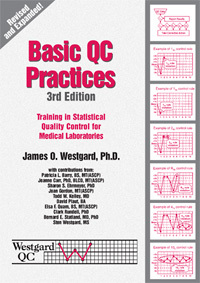 To read the rest of this article, we invite you to purchase the new Basic QC Practices manual, Third edition, or join the Basic QC Practices online course.